HarperScientific now offers the Cylinder Wrack™, a custom plate cylinder storage system. The Cylinder Wrack™ is designed to store plate cylinders for Mark Andy’s P-Series presses. Because of the unique plate cylinders of the P-Series presses, HarperScientific's design provides a storage solution that is equally distinct. The plate cylinder design of the Mark Andy P-Series presses integrates the shaft and bearings into the cylinder assembly. The P-Series cylinders have bearer discs on each end of the shaft. For this reason, they do not fit into any traditional storage solutions. HarperScientific's Cylinder Wrack™ utilizes the space between the bearer and cylinder and opposite bearer and gear to support these cylinders horizontally. 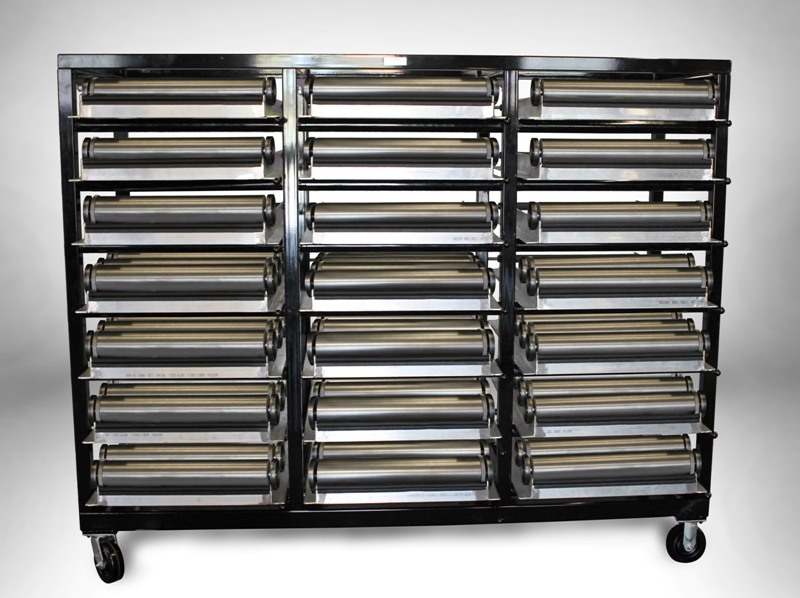 The Cylinder Wrack™ comprises of 21 storage trays, which are arranged in three columns of seven trays. Each tray is padded at the ends and has a cam action to lower the front when desired, to ensure easy unloading. When fully loaded, the Cylinder Wrack™ can hold between 126 and 168 cylinders, depending upon their repeat. To improve the effectiveness of this storage solution, HarperScientific's product development experts put the Cylinder Wrack™ on heavy duty casters, allowing customers to easily move the system to enhance workflow. The Cylinder Wrack™ is easy to load and unload, allowing printers the flexibility to group the like repeats and jobs.